The five metropolitan areas were chosen because they have different histories with respect to immigration and because each has recently experienced significant growth in the foreign-born population. Chicago was chosen because of its long history of immigration; Phoenix because Arizona is the principal gateway for illegal immigrants; Las Vegas because of its accelerated growth; Raleigh-Durham because it is an example of the new Hispanic concentrations in the South; and Washington DC because it is in an economically thriving area, anchored by a majority black city. As a principal entry point for illegal immigrants crossing from Mexico, Arizona is at the frontlines in the debate over immigration. The state has been operating under a state of emergency over illegal immigration since last year, and the Minuteman Project, a civilian group demanding more vigilance at the border, has gained national prominence through its patrols in the state. 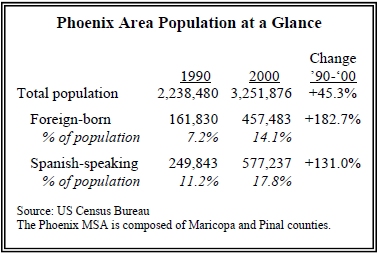 Arizona has also recently experienced a significant increase in the foreign-born population. Between 1990 and 2000, the share of the foreign-born population almost doubled, to 14%. The number of people who speak English either not well or not at all has more than tripled, from about 53,000 to 182,000. In light of all this, it is not surprising that among the five case-study cities in the Pew survey, people in the Phoenix metropolitan area stand out for their strong views on immigrants and immigration. Most notably, it is the only metro among the five in which residents cite immigration as the most important local problem. About eightin- ten (78%) say immigration is a very big or moderately big community problem, the highest of any of the case-study cities and almost double the national rate. Even though they hold immigrants in high regard for their hard work and strong family values, respondents in Phoenix see negative aspects of immigrants and immigration. Nearly half of Phoenix residents (46%) say that Latin American immigrants increase crime and 42% say they often wind up on welfare. On questions of immigration policy, 45% of Phoenix residents say the most effective way to reduce illegal immigration from Mexico is by penalizing employers who hire illegals; far fewer say increasing border patrols (32%) or building more fences on the border would be most effective (10%). These views are similar to those of the public nationally. In their views about what to do with the illegal immigrants already here, Phoenix residents are if anything slightly more welcoming than are the residents of the rest of the country. Some 38% of Phoenix residents, compared with just 32% of the population as a whole, say that illegal immigrants should be allowed to stay permanently, while just 21% of Phoenix residents, compared with 27% of the national public, say that illegal immigrants should be sent home. A clear majority (63%) of Phoenix residents say that present levels of legal immigration should be maintained or increased, the highest among all case-study cities and higher than the national rate (54%). A majority (53%) also says the growing number of newcomers strengthen society, compared with 38% who say they threaten traditional American values. However, half of Phoenix respondents approve of the Minutemen, the highest percentage for any of the case-study cities, and well above the 33% of the national public that voices its approval of this citizen group. Nationally, 42% of respondents say they have not heard of the Minutemen, compared with just 14% in Phoenix. A solid majority in Phoenix (64%) expresses some (37%) or a lot (27%) of confidence in Gov. Janet Napolitano of Arizona to deal with immigration issues. Among the governors of the five states where case-study metro area surveys were conducted, she receives the highest marks. The growth of Las Vegas in the last two decades has been driven by migration—people relocating from around the country to a metropolitan area that is expanding every year. With the growth has come another boom: a significant increase in the foreign-born population. 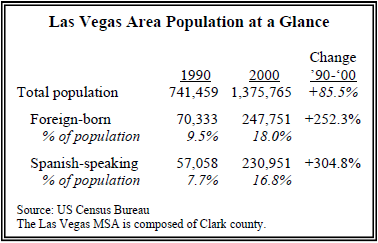 Between 1990 and 2000, the foreign-born population in Las Vegas grew by 250%. Almost one out of every five people (18%) was foreign-born in the year 2000, double the rate as in 1990. The number of people who speak English either not well or not at all increased almost five-fold, and the number who speak Spanish increased by about 300%. The impact of this demographic change, experienced over a short period of time, can be seen in the survey results. Among the case-study cities, Las Vegas is closest to Phoenix in its perception of immigrants and immigration. Significant majorities in both cities cite immigration as either a very big problem (36% in Las Vegas) or moderately big problem (28% in Las Vegas). In Las Vegas, only traffic congestion ranks higher than immigration as a local problem. A majority in Las Vegas (54%) say immigrants from Latin America keep to themselves and do not try to fit in; that figure is the highest among case-study cities and significantly higher than for the nation as a whole (45%). About seven-in-ten (68%) say they “often” come into contact with immigrants who do not speak English, significantly higher than the national rate. A majority in Las Vegas (54%) says most immigrants in the U.S. are illegal and almost twothirds (64%) say most people who have recently moved here are illegal — both significantly higher figures than in the national survey. On immigration policy questions, people in Las Vegas are divided, as is the public nationally. About fourin- ten (38%) believe illegal immigrants now in the U.S should be permitted to stay; 27% favor requiring all illegals to return home; and 26% favor allowing some to stay under a temporary worker program. On an issue of local concern, almost half of Las Vegas residents (49%) say they favor government-sponsored hiring centers for day laborers, while 38% oppose the day labor centers. 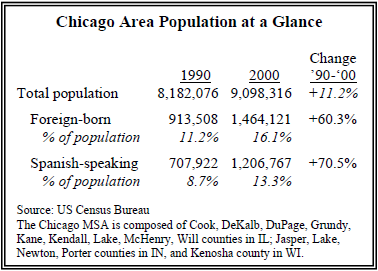 Chicago, long a destination for immigrants, saw its foreign-born population increase by 60% between 1990 and 2000. While the city has historically been home to diverse groups of immigrants, the more recent population gains have been primarily driven by Hispanics. Since 2000, Latinos accounted for almost all the population increase in the city and suburban Cook County. The recent influx of immigrants, especially Hispanics, does not appear to have produced a backlash, according to the survey. On the contrary, the Chicago area emerges as a place that is generally more tolerant of immigrants, even though residents express some concern that immigration could affect jobs. This generally welcoming outlook of Chicagoans is especially evident when their views are compared with those of residents of Phoenix, Las Vegas and Raleigh-Durham, other case-study metropolitan areas that have all experienced recent spikes in immigration. Among the metropolitan areas surveyed, only Washington DC appears more welcoming. Only about one-in-five Chicago area residents (19%) rate immigration as a “very big” problem for their local community. That is about the same number as the public nationally (21%), but far less than the number citing immigration as a major local problem in Phoenix (55%) or Las Vegas (36%). Nearly two-thirds of Chicago area residents (64%) say that recent immigrants have not had much of an effect on the quality of local government services. In their views of immigration policy, many in Chicago tend toward the less punitive options. A plurality of Chicago residents say illegal immigrants should be allowed to say in the U.S. permanently (39%). Three-quarters believe children of illegal immigrants should be allowed to attend public schools. More than half (54%) say illegal immigrants who graduate from high school in Illinois should be allowed to attend public colleges at in-state tuition costs. However, as in the other metropolitan areas, a sizable majority (60%) says illegal immigrants should not be eligible to receive social services. Perceptions in Chicago about immigration harden, however, on some economic issues. Nearly four-in-ten Chicago residents (39%) say their biggest concern about illegal immigration is that it hurts American jobs, the highest among the cities and higher than the national rate (31%). More than a third (36%) say legal immigration is hurting American jobs. Unlike the other metropolitan areas in the study, Chicago suffered a loss in manufacturing jobs during the 1990s. The response on some economic questions varies by race. For example, among non-Hispanic African Americans, fully 41% say either they or a family member has lost a job to an immigrant, compared with 15% of non-Hispanic whites who say this. The population of the Raleigh- Durham metropolitan area increased by 38% between 1990 and 2000. Like other parts of the South, Raleigh-Durham has been transformed by a robust economy and by the people who moved there in search of jobs. The foreign-born population, made up primarily by Hispanics, grew by nearly four-fold in 10 years. But unlike other metropolitan areas where Hispanics have traditionally settled, Raleigh-Durham had no established Latino community before 1990. The subsequent demographic transformation over a short period of time makes Raleigh-Durham and other similar communities in the South distinct from the rest of the country. In Raleigh-Durham alone, the number of people who speak Spanish increased by nearly five-fold between 1990 and 2000. About a quarter of Raleigh-Durham residents (26%) cite immigration as a ‘very big’ local problem, slightly more than the national average (21%). And more than a third (36%) say that recent immigrants have had a negative effect on government services, compared with 26% nationally. But as is the case in the other metropolitan areas surveyed, Raleigh-Durham residents overwhelmingly view Latin American immigrants as very hard-working (87%) and having strong family values (85%). In Raleigh-Durham, about two-thirds (68%) say local police should be required to check someone’s immigration status during routine activities such as traffic stops. A similar majority (67%) says illegal immigrants should not be eligible for social services. Some 62% of Raleigh-Durham residents say that recent immigrants do not pay their share of taxes. A majority (52%) says that the most effective way to reduce illegal immigration from Mexico is by increasing the penalties for employers who hire illegal workers. A majority (55%) says today’s immigrants are more willing (20%) or about as willing (35%) to adapt as were immigrants in the early 1900s, higher than the national rate (49%). Nearly eightin- ten (77%) say children of illegal immigrants should be allowed to attend public school. Once defined by the federal government and its vast workforce, the Washington DC area has undergone a dramatic transformation in the last 25 years. It is now home to some of the wealthiest and fastest growing suburban counties in the country; the government is no longer the main employer; and the capital city is ringed by suburbs notable for their diversity. The metropolitan area is a prime example of immigration altering the suburban landscape. 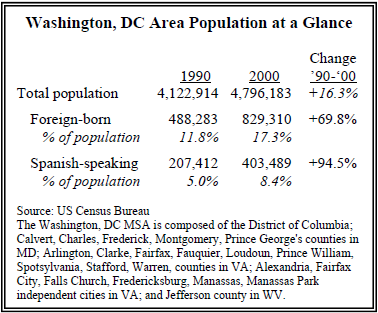 Hispanics, Asians and others have settled in suburban Maryland and Virginia in great numbers. In the metropolitan area, the Hispanic population alone more than doubled in two decades. Between 1990 and 2000, the foreign-born population grew by almost 70%. The number of people who speak Spanish grew by 95% and those who do not speak English or do not speak it well increased by 112%. In the survey, Washington stands out for its generally welcoming view of immigrants when compared to the others in the case studies. More than half (54%) say the growing number of newcomers to the U.S. strengthens society in general, and most think that immigrants strengthen the country through hard work (56%). A majority in the Washington DC area (54%) supports government-sponsored centers for day laborers, an issue that has divided communities in Northern Virginia and suburban Maryland. 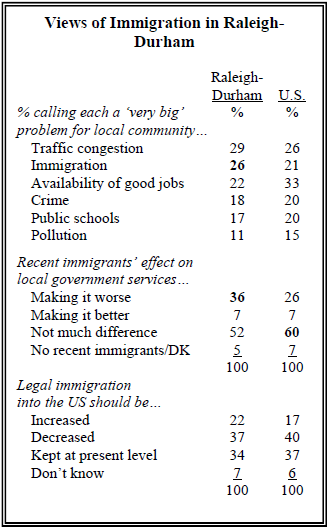 Only about one-in-five Washingtonians (21%) view immigration as a very big local problem; in contrast, nearly three times that number (60%) cites traffic congestion as a major local problem. By a higher rate than in the other cities, people in Washington say immigrants take jobs others do not want and that immigrants pay their fair share of taxes. A majority (55%) also says recent immigrants are not a factor in the quality of local government services. Compared to the other case-study cities, fewer people in Washington DC (40%) say that the country has to be protected against foreign influence. On policy questions, half say the most effective way of reducing cross-border illegal immigration from Mexico is by penalizing employers who hire illegal workers. And a plurality of Washingtonians (37%) believes that illegal immigrants should be permitted to stay in the country permanently. II. Immigration: How Big a Problem?